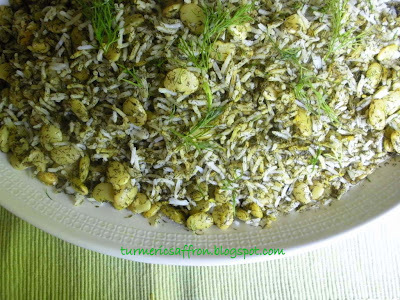 Combination of fresh finely chopped dill along with preferably fresh baby Lima beans or Fava beans and aromatic rice make a very delicious meal. I think the person who came up with the idea of throwing these ingredients together must have been a culinary genius of her time. This mixed rice could be served as a vegetarian dish along with some yogurt and cucumber (mast-o-khiar) side dish. 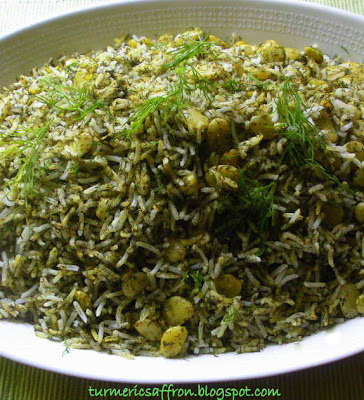 شوید باقالی پلو Shevid Baghali Polw (dill and lima beans rice) is usually served with lamb shanks or chicken. I must say that it goes very well with turkey too. I have made it several times as a side dish for Thanksgiving dinner. 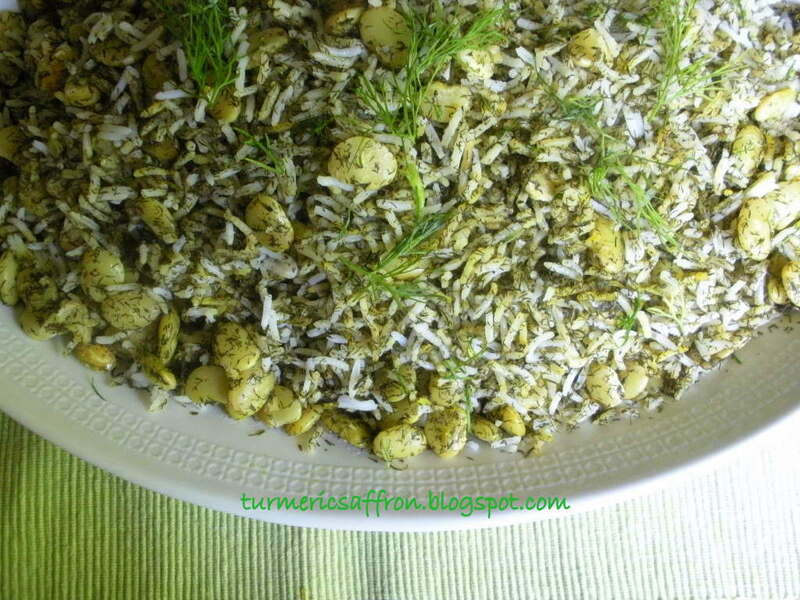 I like the rice to be covered with fresh and some dried dill to cover every grain of rice. Also, I use equal portions of Lima beans and rice. To me, cooking Persian food is not an exact science. I usually start with having the main ingredients for a dish that I like to make but I tend to kind of add my personal touches and preferences to it along the way. 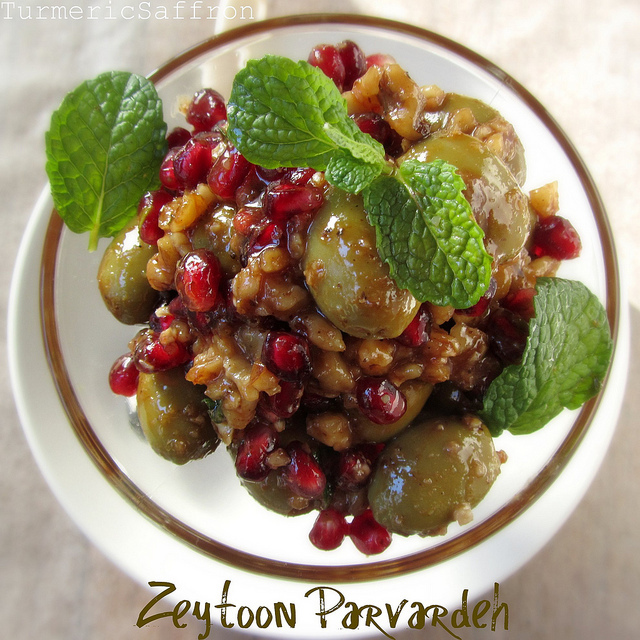 However, if there is bit of change to an original Persian recipe, I’ll make sure to point out and make a note of it in my posts. Many of you know that there may be many variations of a recipe. It depends which part of the country you are from, north or south or how your mom has taught you to cook. In a medium bowl mix dill (fresh or dried), lima beans, a dash of salt, cinnamon and turmeric. Mix well and set aside. Wash rice with cool water a few times. Soak in 4 cups of water, add 2-3 tablespoons of salt and set aside for a couple of hours. In a large non-stick pot that has a tight fitting lid, bring 4 cups of water to a rapid boil. Drain rice and pour into boiling water and boil uncovered for 10 minutes. Test to see if the rice is ready. Rice should be firm in the center and soft on the outside. Drain and rinse with cool water. Wash the pot and return to heat, add 3 tablespoons of oil. Place a layer of rice into the pot and then a layer of dill and Lima beans. Then another layer of rice, continue building it into a pyramid shape. In order to release the steam make 2-3 holes in the rice with the bottom of the spatula. Cover and cook for 5-7 minutes on medium-high heat until rice is steaming, pour 2 tablespoons oil and 1/4 cup of water over the rice. Lower heat and steam the rice for another 45-50 minutes. Serve on a platter along with lamb shanks or chicken pieces or just by itself as a vegetarian dish. If you find the rice a bit on the dry side drizzle some melted butter over the rice. I grew up eating torshi with my meal. I make pickles all the time and I have several jars of torshi stored away in a cool place. I adore pickled eggplant as well. My mother was an avid torshi maker. 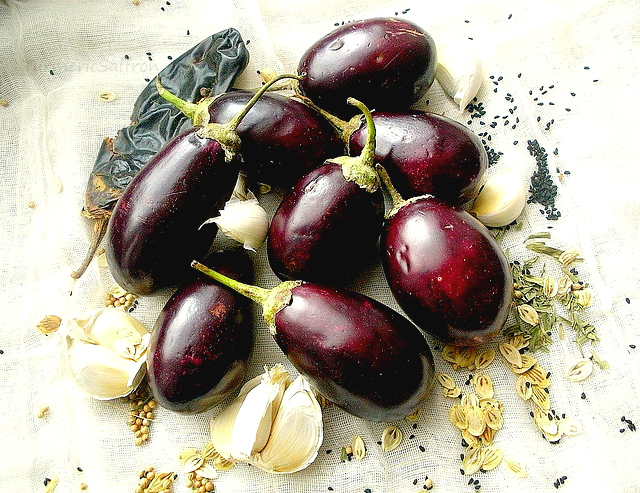 Every time she came here to visit making ترشی بادمجان pickled eggplant was one of the very first things she did. She believed eating torshi with your meal enhance the flavor of food and health benefits. 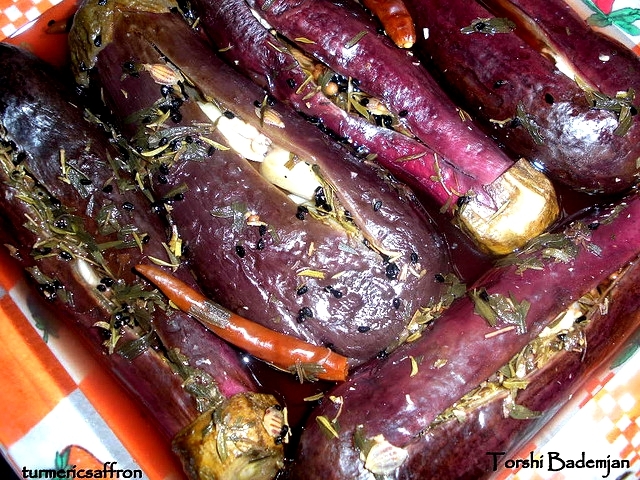 My mother's pickled eggplant recipe is one of my favorite torshi recipes. It's an easy and quick way to make torshi-e bademjan. This torshi does not require a long time to ferment. In fact it is ready to be served in a couple of days. Mix all the dried ingredients together in a small bowl. 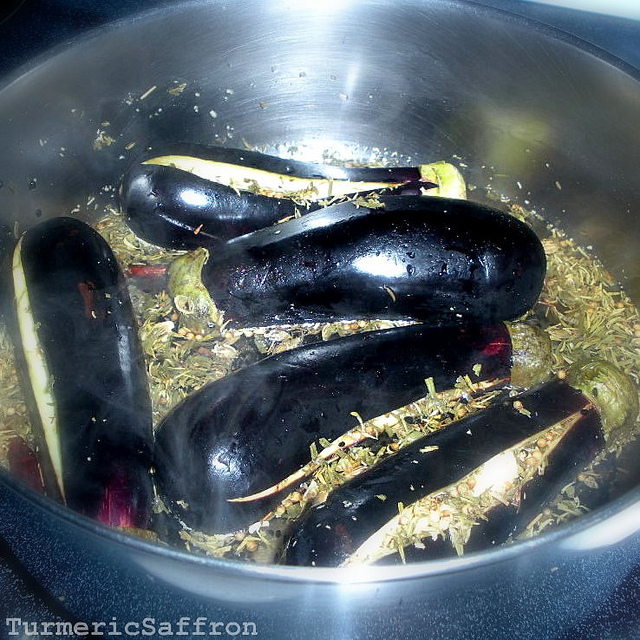 Place 2-3 garlic clove halves in each eggplant with some of the dried herb and spice mixture. In a large heavy bottomed pot, combine 2 cups of vinegar and 1 cup of water over a medium-low heat. Place the eggplant in the pot, sprinkle the remaining spices over the eggplant, cover and simmer for 30-40 minutes or until the eggplant is fully cooked. Let it completely cool before transferring them into clean glass jars. Add more vinegar and salt if needed. Store in a cool place. This pickled eggplant will be ready to eat after 2-3 days.